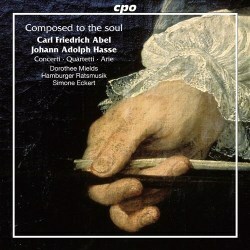 This album features works for or with viola da gamba, by gamba player-composer Carl Friedrich Abel and by Johann Adolf Hasse. Carl Friedrich Abel came from a musical family, preceded by at least three generations of professional gamba players. The deep family root probably explains why he persisted as a performer of and composer for the viola da gamba at a time when the instrument was getting obsolete. He wrote a large number of compositions for his own instrument, as well as more conventional works like symphonies and sonatas for various instruments. According to the booklet, the two surviving quartets for viola da gamba, violin, viola and cello (both featured on this disc) are contemporary manuscript copies of his Quartet No.2 in Bb (WKO62) and Quartet No.5 in A (WKO65), published in Six Quartettos for Two Violins, a Tenor and Violoncello Obbligati, op.8 (1768). The copyist transposed the first violin part an octave down and assigned it to the viola da gamba. The music is in galant style. I am not sure whether it is the music itself or the manner in which it is played here - probably both - but the music comes out understated and bland. Simone Eckert appears to be stretched by some of the virtuosic passages in the first movement of the Quartet in B flat. Abel’s Harpsichord Concerto in D is a much more lively affair, and reminds me why some think highly of Abel’s music; one of Abel’s symphonies was once misattributed to Mozart. To me it was the highlight of the disc, which is unfortunate because I think it is supposed to be a filler for a disc showcasing the viola da gamba. Frena le belle lagrime is described in the booklet as Abel’s solo surviving vocal work. Here again the performance is bland. The music is not very inspiring, and seems to outstay its welcome for its eleven-and-a-half minutes duration. I wonder if more elaborate ornamentations in the later stanzas of the aria, a common practice back then, would have better kept listeners' attention. Johann Adolf Hasse was a well-known opera composer. The aria L’Augelletto in lacci stretto is taken from his opera La Didone abbandonata. The scoring is the same as for Abel’s aria, with soprano, viola da gamba, strings and basso continuo. It is a more interesting piece, but again I feel that a less understated performance than one offered here, with more elaborate ornamentation in the later stanzas, would have done better justice to the music. The booklet is in German and English, with the sung text given in its original Italian as well as German and English translations. Simone Eckert wrote the programme notes, and they provide many details about Abel’s life, although I am sceptical about some of the claims Ms. Eckert made. For example, she claimed that Abel moved to Leipzig in 1728 because the court orchestra in Cöthen was disbanded. I would not have expected a 15-year-old Carl Friedrich Abel to be a member of the court orchestra. Ms. Eckert also speculated that “Bach’s Sonata for Viola da Gamba, thought today to have originated between 1736 and 1741, may well have been intended for Abel”, and that “The same may be true of the revised version of the St. Matthew Passion performed in Leipzig in 1742, where the aria ‘Komm süsses Kreuz’ was reworked for the viola da gamba”. How a teenaged Abel would have inspired Bach was beyond me. It was interesting to hear the viola da gamba, normally associated with music from much earlier times, play music in the galant style. Beside the novelty value, I cannot find much to admire about this album.